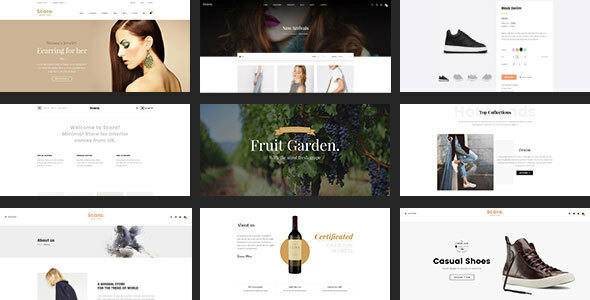 SCARA – Multipurpose HTML Template is a full-responsive html template which is used for multipurpose online store page (Wine, Fashion, Shoes, Jewelry, Interior, …). It has 34 HTML pages with 8 homepages. Every single element of this template is entirely responsive, as content can be viewed from desktop and mobile devices. Unique design for each pages. 100% fully Responsive with Twitter Bootstrap 3. See demo and guide for SCARA – Multipurpose HTML Template! If you like our product, please don’t forget to review and rate it . We will support you as soon as possible. - Update: Homepage 5, 6, 7, 8. - Update: Add theme color select bar. - Fix : problem of RTL on ready.